(Daily) Based on Jan-Dec of 2012. 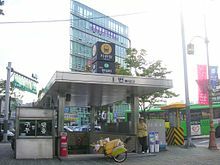 Wangsimni Station is a station on the Seoul Subway Line 2, Seoul Subway Line 5, Gyeongui–Jungang Line, and the Bundang Line. It is located in Haengdang-dong, Seongdong-gu, Seoul. The name of the station, "Wangsimni", is related to a historical account dating from 14th century Korea. After establishing and becoming the first king of the Joseon dynasty, Yi Seong-gye presented the great Buddhist monk Muhak with the task of finding a site for the new capital. After searching for a suitable place, the monk stopped and saw an old farmer passing by on his ox. The farmer pointed toward the northwest and said to him, wangsimni (往十里), literally meaning 'go ten more li (li = a unit measure that equals to one-third of a mile).' The startled Muhak went to the northwest as he was told and ended up at the southern foot of Mt. Bugak, where Gyeongbokgung now stands. This was how Hanyang (present-day Seoul) was born. In September 2008, Wangsimni station was remodeled to a private invested station. This station became multiplex space with several major features down below. Wikimedia Commons has media related to Wangsimni Station. ^ a b c d "왕십리역" (in Korean). Doosan Encyclopedia. Retrieved 2015-08-30. ^ a b c Monthly Number of Passengers between Subway Stations. Korea Transportation Database, 2013. Retrieved 2013-10-15. This page was last edited on 22 April 2019, at 12:20 (UTC).